Toronto, ON (Jan. 29, 2019) – So much for “getting away from it all!” A new study shows half of Canadians say they check their office emails while travelling on vacation. Of those, 24 per cent say they do so at least once, if not several times, each day. 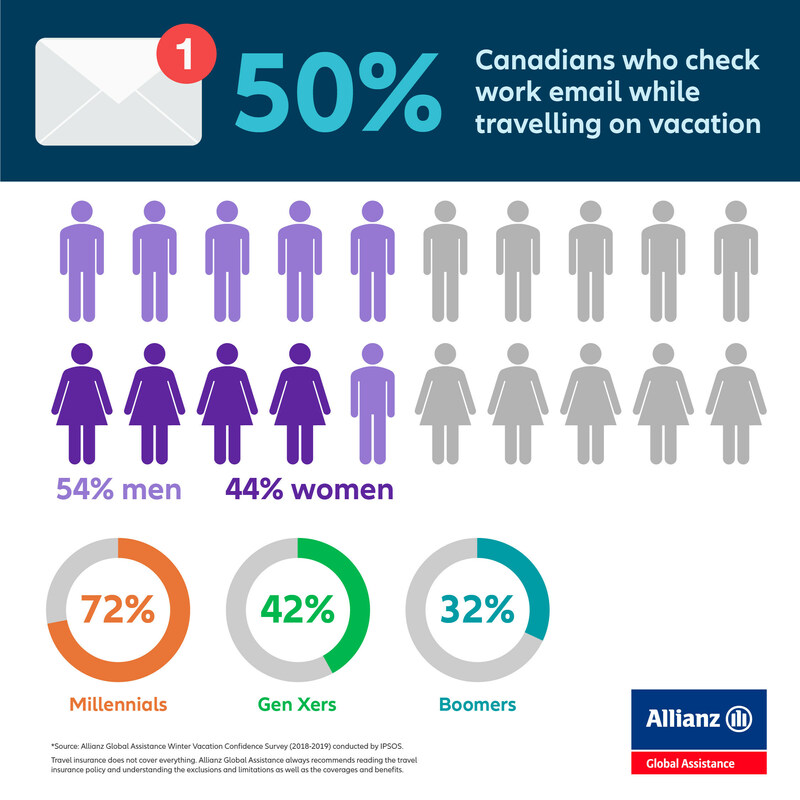 The results were gathered in a survey of Canadian travellers by Allianz Global Assistance Canada, a leading provider of travel insurance and assistance services, which asked Canadians about their travel habits. For 30 years, Allianz Global Assistance has supported travelling Canadians when they need it most with value-added travel insurance and assistance services. More than 800 employees support long-term partnerships with some of the best known brands in the travel and financial services markets. Allianz Global Assistance also serves as an outsource provider for in-bound call centre services and claims administration for health insurers, property and casualty insurers and credit card companies. Allianz Global Assistance is a specialist brand of Allianz Partners for assistance and travel insurance, and is a registered business name of AZGA Service Canada Inc. and AZGA Insurance Agency Canada Ltd. For more information, visit www.allianz-assistance.ca. For more information, please visit: www.allianz-partners.com.